The Bbq Tools Set including a knife, a bbq fork, a Silicon Brush, a spatula with serrated edge and tong. Crafted from high-quality STAINLESS STEEL- you`ll feel the difference from the moment you hold these tools in your hand; the handles are easy to hold onto, and the HEAT-RESISTANT handles allow you to maintain a safe distance from the high heat of the grill and prevents heat from traveling through the tool to your hands; Having trouble moving a roast? These utensils are sturdy ! Looking for ideal 6pcs BBQ Tools Set Manufacturer & supplier ? We have a wide selection at great prices to help you get creative. All the BBQ Tools Set with Silicon Brush are quality guaranteed. 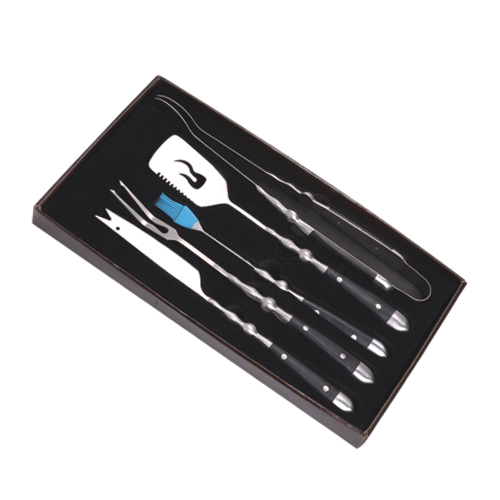 We are China Origin Factory of 6pcs Bbq Grill Tools Set. If you have any question, please feel free to contact us.